The purpose of this note is to outline some changes observed by the author in the aerial behaviour of large gulls Larus fuscus graellsii Brehm, 1857 and Larus argentatus Pontoppidan, 1763 during the summer of 2013. They are changes only in the sense that I cannot precisely recall observing them during the past 50 or so years neither can I find references for them. Towards the end of July 2013, especially in the Pershore/Bredon Hill area of south Worcestershire, large numbers of gulls were observed planing across the wider agricultural landscape moving from one location to another. Typically these groups would number up to about 400 birds forming low level flights calling continuously to such an extent that it became a loud often more or less continuous cacophony of sound over consecutive days. The birds were commented on as seeming noticeably bold. 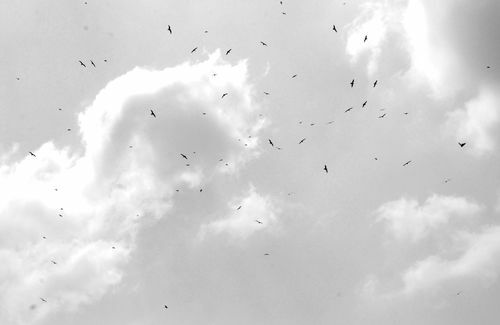 The flight lines covered a considerable area and the birds tended to be dispersed somewhat equidistantly in them so that the arrangement of the birds in flight and their behaviour appeared to be highly organised; they swept back and forth at a height of some 30 metres or so. These movements of birds appeared to be in response to agricultural activity, in some cases grass cutting. The attraction that this has for larger gulls is well-known and nesting birds will travel some distance for the opportunity to catch small dispersing rodents. What was different about 2013 was the scale of the attraction and the duration of these assemblages which persisted into August for more than three weeks in total. A second feature of these assemblages was the use made by the gulls from time to time of thermal air currents. Flocks of gulls would not only utilise thermals (in itself not unusual and sometimes observed where gulls congregate inland), but completely fill them thus enabling the physical dimensions of the upwelling air masses to be observed and calculated. The gulls were found to be using thermals with a diameter varying from c110 metres to c140 metres (01) and with a height up to 350 metres. Large numbers of gulls would elevate to these heights eventually achieving significant lateral movement from the collapsing tops of the actively deforming masses of warm air. Seemingly they were using these thermals to leave the area and thus may have been roving the landscape; wherever these mostly adult birds originated from it seemed that on some days they were travelling widely. I discussed this matter with a number of people from which it appeared that this behaviour extended over a wider area. An observer in south Wales some 100 kms distant thought that more gulls than usual had ‘moved inland’ at this time possibly as a response to grass cutting for silage. Explanations for this behaviour might lie with developing changes in agricultural technology or in the ability of gulls to capitalise on food resources.